Picture time! See this fella? He’s a genius cucullatus, to give him his Latin name, but whether he was a Roman import or a native, his original owner wouldn’t have called him that. Genius cucullatus just means, ‘spirit in a hood’. 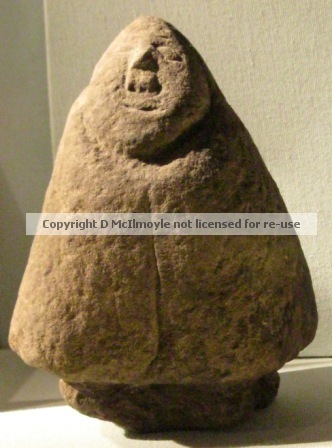 This one, which was found at Birdoswald on Hadrian’s Wall, is the only one in Britain which is a single standing statue. They’re usually carved in relief on a flat stone, and in Britain, they are often depicted in groups of three.I wish it was simple matter to tell you what he represents, but that’s not possible. He’s often linked with a hooded deity of Greek origin, Telesphorus. The latter was a dwarf and son of Asclepius, the Greek god of healing, and is often depicted with a scroll to show how clever he is. Some scholars have thought that the Greek Telesphorus was adopted from the Galatians of Anatolia – who came from celtic Gaul (France) in the 3rd century BCE – but this is by no means certain. Our only other clue for the British examples is that it’s not unusual for examples found in southern England to hold eggs, which might mean that they are responsible for fertility or youth. There are no inscriptions associated with a genius cucullatus in Britain, so there are no written clues as to his significance. This one was found at Birdoswald Roman fort, which was active in the 2nd, 3rd and 4th centuries. Other Cumbrian examples were found at other Roman forts – Carlisle and Housesteads. This might lead you to think that they are continental gods brought over by Roman soldiers, but it’s not that straight forward. Mabon, for example, was a popular deity along Hadrian’s Wall, and he’s very much a local. It was also common practice for visiting Romans to conflate local gods with Roman ones. This meant that they assumed that gods were the same across the world, but were known by different names; hence Lugus of Luguvalium (Carlisle) was often associated with the Roman Mercury, and Cocidius, who was strongly located with Bewcastle, was conflated with the Roman Mars, amongst others. Perhaps our hoodie, then is <insert celtic name> Telesphorus. The surviving two genii cucullati from three. Found in Carlisle. The clue to the local, British/celtic origin of this genius cucullatus is the fact that they’re more often found in groups of three than as a single figure. There are other native gods where we have a decent understanding of their triplicity; each figure represents a different characteristic, or power, of the single being. Brigid, for example, was a goddess of childbirth, a mother, and goddess of prosperity.1Perhaps one day we’ll find a triple genius cucullatus with symbols to make clear his role in life 1800 years ago. In the meanwhile, I quite like him, don’t you?This statue, and other similar ones, is on display at Tullie House Museum in Carlisle. NB. 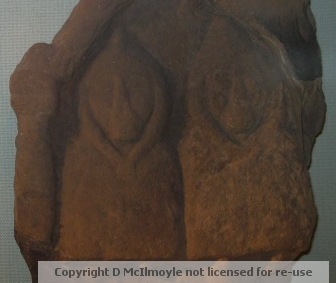 I had permission to take these pictures at Tullie House Museum, Carlisle. Picture are my copyright. Please don’t pinch them. This entry was posted in Folklore of Cumbria, Folklore: Magical, History of Cumbria, History: Pre-Roman gods and goddesses, History: Roman and tagged cumbrian history, genii cucullati, genius cucullatus, native british gods. Bookmark the permalink. FYI, there are all kinds of ways to watermark photos to prevent other bloggers lifting them. Many of these apps, like http://picmarkr.com are free. Another intriguing post, thanks. I’ll have to dig out my Miranda Green titles, as I don’t recall the link with Telesphorus (no doubt to skim-reading, hopefully not down to age). I love it that the Birdoswald example is a standalone stone, halfway between a statue and a monolith. Hi Ed – good to see you. The Miranda Green ref is about Brigid, not Telesphorus – he seems to be a rather more elusive character! The Birdoswald version is excellent, and unique in the UK. He’s about 8 inches high and rather cute (but don’t tell him I said that, him being a god and all…). Impressive for only 8″! the shape reminds me of some of the Lewis chessmen, with their pyramidal helmets. Yes, I see what you mean! Completely different cultural origins, but who knows! I do like these sculptures. I also rather like the fact that we don’t know precisely why they were made or what they represent. Every time I go to the museum in Cirencester I puzzle over these fellows (there’s quite a concentration of them in Gloucestershire). I’m looking forward to seeing some of the northern ones in the flesh (so to speak) soon; especially the one from Birdoswald. I know you’ve already been nominated at least once, by the way, but I’ve awarded you the Liebster Blog Award. They are brilliant, aren’t they? I haven’t seen the Gloucestershire cousins but it would be great to do so – I gather lots of them carry eggs around (handy snack?). Thank you very much for the Liebster Award. I’ve been very remiss in following these up – it’s not that I don’t appreciate it but rather that I’ve been wading through a field of life’s curved balls (see how many metaphors I mixed there – not safe to be left with a keyboard 😉 ). I’ve every intention of catching up soon. When it comes to the award, you’re very welcome; this is a hugely informative and enjoyable blog which I think fully deserves it. And I hope that soon life will be sending fewer fields of curved balls your way! A rather interesting post from the pen of Esmeraldamac on the ‘Hooded Ones’ – don’t know who they are, well you’re not the only one! A mysterious trinity, often (if you’re lucky) to be found in some people’s UPG; contact with them is rare, but not unknown. On the Gloucestershire hooded trios, Stephen Yeates has a book, The Tribe of Witches which deal with them a lot in the context of the Hwicce. I’m not sure what to make of it in terms of historical research into the Hwicce (one of my areas of work) but might be of interest to you – and I’d quite like to know what others think of it! Hi – I really like your site, but am puzzled that the Three Mothers have become male. Especially as they are sometimes found with eggs, and sometimes apples or bread. The word ‘lady’ means ‘giver of bread’. The apple is the fruit of the Goddess. And even from a symbolic viewpoint, men don’t have ova, ovaries, or an ovarian cycle. Stone circles are also not round but egg shaped. Marija Gimbutas writes of an underground temple in Gozo, with egg shaped niches where women went to dream about the spirit that would incarnate in them, and in Matriarchal Societies by Heide Goettner-Abendroth, her evidence from people living in matriarchal societies today is that they build the megaliths as spirit stones to the ancestral dead of the clan (and are still building them), and the women are not only sacred because they create life, but because they are able to re-birth the ancestral spirits of the clan. This is the original role of the shaman (a female word). Her book is amazing, so much clicks into place after reading it. For those who might think that matriarchies are patriarchies in reverse, this book shows that the structure of these societies have gender equality, consensus, and a belief in the spirit in all life – immanence. Having once fended off a born again christian trying to convert me with the reply – I’m coming back as a microbe (very effective) – I discover that matriarchies believe that all living beings re-incarnate – so I guess only microbes can be reborn as microbes !!! !